As we reported here in April, Maserati will begin building the new 2014 Alfa Romeo 4C at their Maserati factory in Modena Italy plant along side their flagship Gran Turismo coupe and convertible models. 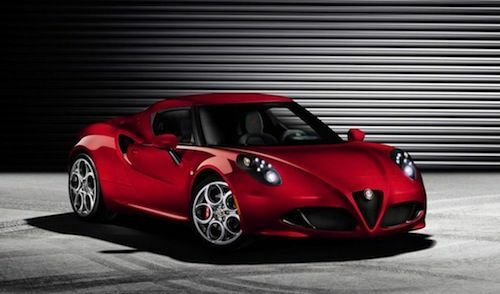 Alfa Romeo has officially made the announcement that the 4C sports car will make its debut at the 2013 Geneva Motor Show in March. They also revealed the new super compact Alfa Romeo 2-seater will go on sale in 2013 and will mark the return of the Italian brand in the United States. We reported here last year the new rear-drive mid engine car will launch in the U.S. summer of 2013. While it was originally thought the Alfa Romeo 4C would take its bow at the 2013 Detroit Auto show in January, Alfa Romeo decided to reveal the final version of the sports car at the 83rd Geneva International Motor Show where it was first unveiled in 2011. The new 2014 Alfa Romeo 4C making its debut in Geneva, was born from the experience acquired through the Alfa Romeo 8C Competizione. The rear-drive mid-engine design is at the heart of the Alfa Romeo DNA and will give the new sports car the kind of performance that driving enthusiasts are looking for. The car will be sold globally and this marks the growth plan that the Italian brand has around the world. The Italian company also plans to launch three new models over the next 24 months. Fiat has big plans for growth of its brands in North American, and the Alfa Romeo 4C is a big part of that plan. The 4C’s rear-wheel drive mid-engine design will weight less than 1870 pounds. It will be powered by a 1.7-liter, direct-injected turbocharged four-cylinder aluminum engine that will pump out 296 horsepower. The aluminum-block engine will also be used in the new 2015 Spider and could be used in other Fiat/Chrysler models across the lineup. The new 4C sports car will be less than 4 meters wide, 200 cm, 118 cm high and has a wheelbase of less than 2.4 meters. The two-seater will have a power / weight ratio of less than 4 kg / hp. With that type of horsepower and light weight, the 4C will be one quick sports car. Alfa Romeo says the new engine will feature a “revolutionary” control system called Scavaging which eliminates any turbo lag. The 1.7-liter, direct-injected turbocharged four-cylinder aluminum engine will be mated to an automatic dual clutch Alfa TCT transmission with steering wheel shift paddles and a new Alfa DNA selector with a 'Race' mode setting for optimum performance in the curves. The new chassis is made entirely of carbon fiber which plays a key role in its structural integrity. The carbon fiber was originally developed by Italian race car specialist Dallara for the Alfa 8C, Bugatti Veyron and KTM-Bow. Underneath, the subframe is formed largely from aluminum with the suspension consisting of multiple links in the front and struts out back. Weight distribution should be ideal with a 40-percent front/60-percent rear, and with the engine mated to a dual-clutch gearbox, it should be very responsive. The combination of light weight and the power-to-weight ratio suggests the performance of the 4C will be on par with that of a Porsche Cayman.The lightweight two-door 4C sports car is expected to produce 4.5 second 0-62-mph times. Alfa Romeo unveiled the 4C at the 2011 Geneva International Motor Show and it received much fan fare and attention immediately. That Concept car has won numerous awards and is the platform for the new 2014 Alfa Romeo 4C production car. That concept car was awarded the 'AutoBild Design Award' (2011, Germany), 'Design Award for Concept Cars & Prototypes' (2012, Italy) and 'Most Exciting Car of 2013 -' What Car? ' (2013, UK). Reports say that a new 4C convertible variant will be also be built and will arrive a year after the coupe in the summer of 2014. Look for the Alfa Romeo 4C coupe sports car to arrive on U.S. shore this summer. Reports say that only 2500 examples will be built for total global production. Pricing has not yet been announced, but the new 2014 Alfa Romeo 4C could be above $45,000 with only 1000 units being sold in the U.S. This is welcome news for those who have long waited for the return of Alfa Romeo to North America.